AOA’s trip challenge ratings have been developed to help you find the right trip for you and your traveling companions. If you have any questions about these ratings, please email us at tripsupport@aoa-adventures.com. Fitness: The physical challenge of a trip. Judging your fitness level appropriately will help you enjoy your trip. Comfort: Every adventure has a measure of discomfort, but some are more plush than others. Solitude: Setting the expectation for how remote the trip may be and whether you will see other adventurers. Participation: On some trips, you may be asked to help with tasks related to camp, meals, or accommodating other group members. Fitness is one of the most important elements to consider when planning an active adventure vacation. 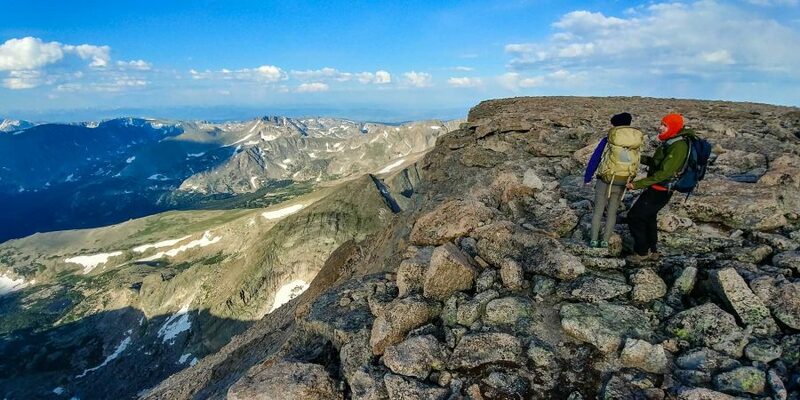 If you are not properly prepared for the physical demands of a trip, it will be hard to enjoy the experience fully and could even lead to a dangerous situation in the backcountry. 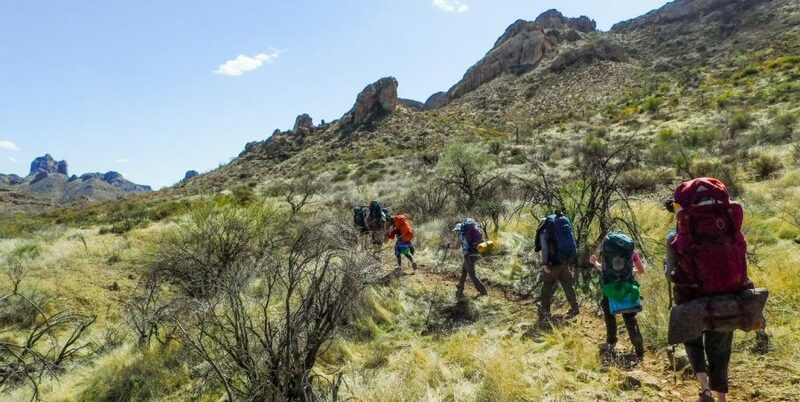 Fitness depends on a number of factors including the amount of weight you are expected to carry in your pack, how well maintained and how steep the trails are, the daily hiking distance on your trip, and the speed at which the group will be hiking. Pack weight for on-backpacking trips is typically 10-15 lbs while pack weight for backpacking trips will be 35-50 lbs. On Fitness level 1 trips, guests will need only the ability to walk on improved surfaces with little elevation change for up to 5 miles per day with the ability to travel at their own speed and/or be comfortable modifying the activity to be more suitable for the hiker based on an assessment and plan made with their guide. 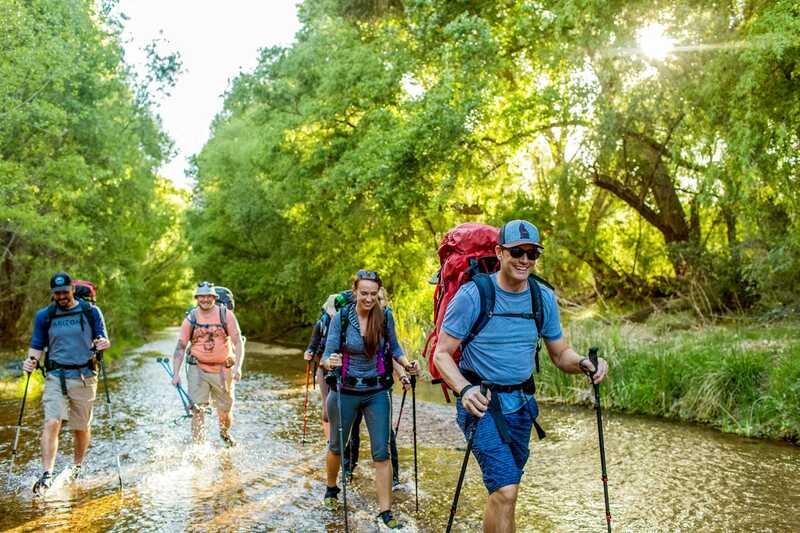 On Fitness level 2 trips, guests will need the ability to hike on established trails with some elevation change, over uneven natural surfaces for up to 8 miles per day with the ability to travel at their own speed and/or reroute/shorten a hike as they see fit. 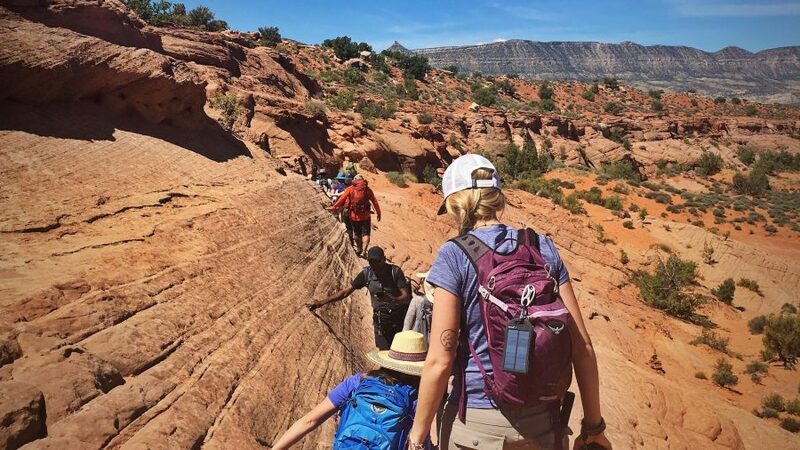 On Fitness level 3 trips, guests will need the ability to hike on established trails with noticeable elevation change over uneven natural surfaces for up to 10 miles per day. Some routes may not have a shorter or turn-around option and the group will move at a 2 to 3 mph pace with breaks. 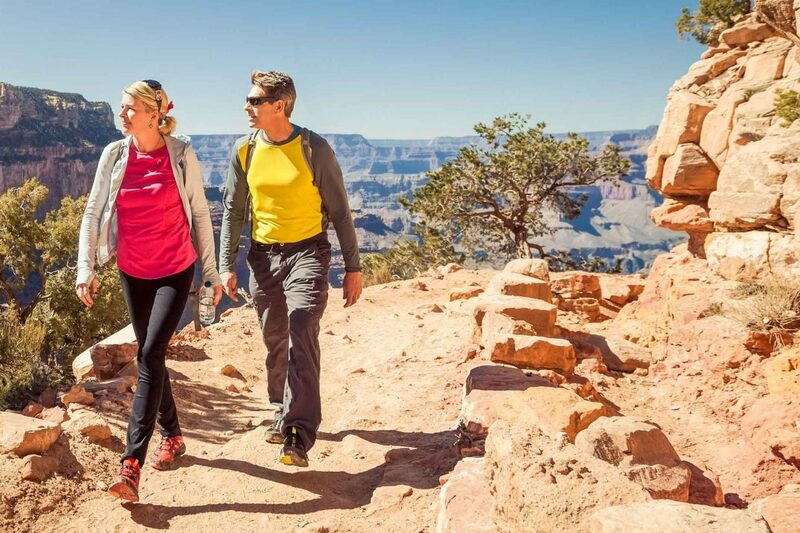 On Fitness level 4 trips, guests will need the ability to hike on trails that may have physical obstacles or barriers with aggressive elevation change for up to 15 miles per day. In every case other than an emergency situation, hikes are one-way and are performed at a 2 to 3 mph pace with breaks. On Fitness level 5 trips, guests will need the ability to hike on and off less-maintained trails in places that likely have physical obstacles or barriers with aggressive elevation change for up to 15 miles or more per day, In every case other than an emergency situation, hikes are one-way, are performed at a 3+ mph pace with breaks, and have no rest day between hikes. 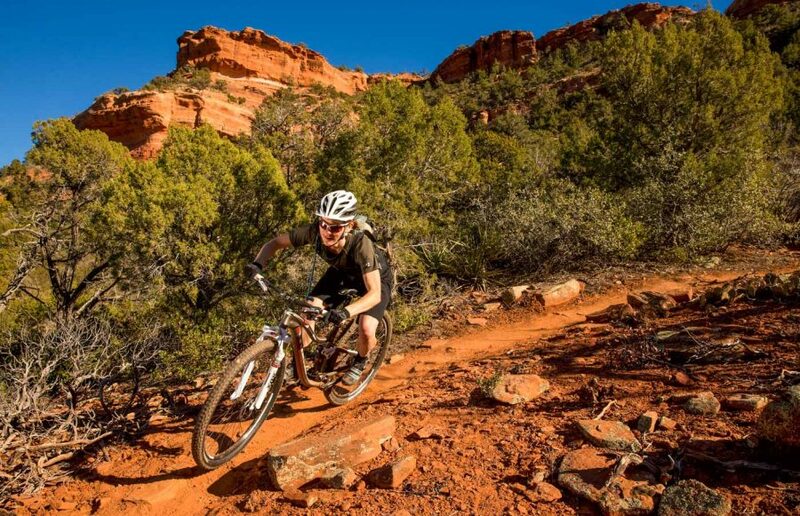 Fitness ratings are determined by a number of different factors including daily mileage, elevation change, average group speed, and required technical skills (mountain biking). On Fitness Level 1 biking trips, guests will need only the ability to ride on mostly level roads/streets/pathways or on mountain bike trails with rolling hills and no technical obstacles. Elevation change is minimal and distances could range between 0 and 15 miles per day for road, or 0 to 8 miles per day for mountain. Guests have the ability to travel at their own speed and/or reroute/shorten a route as they see fit. On Fitness Level 2 biking trips, guests will need the ability to ride on well-maintained roads/streets/pathways or on mountain bike trails with easy-to-navigate obstacles. Elevation change is minimal to moderate and distances could range between 15 and 25 miles per day for road, or 8 to 10 miles per day for mountain. Guests have the ability to travel at their own speed and/or reroute/shorten a route as they see fit. On Fitness Level 3 biking trips, guests will need the ability to ride on well-maintained roads/streets/pathways or on mountain bike trails with moderately challenging obstacles. 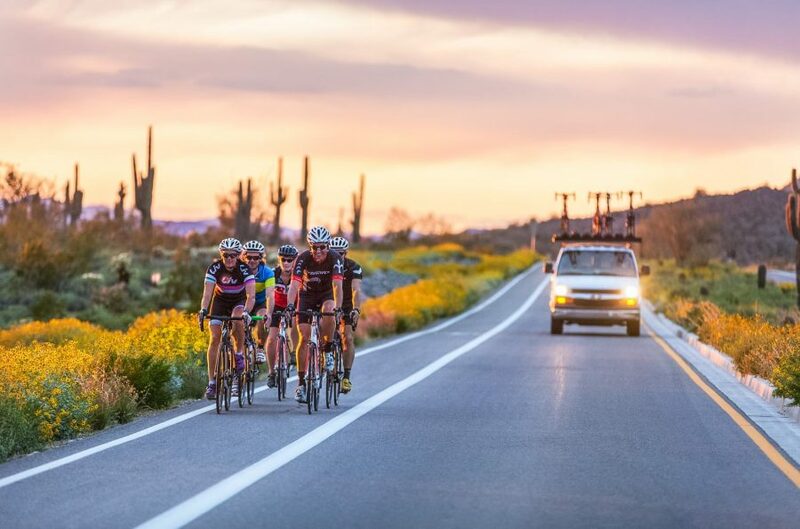 Elevation change is moderate and noticeable on some climbs and distances could range between 25 and 50 miles per day for road, or 10 to 20 miles per day for mountain. Guests are generally travelling at a group pace but have the ability to rest on demand and/or reroute/shorten a route for most of the rides. 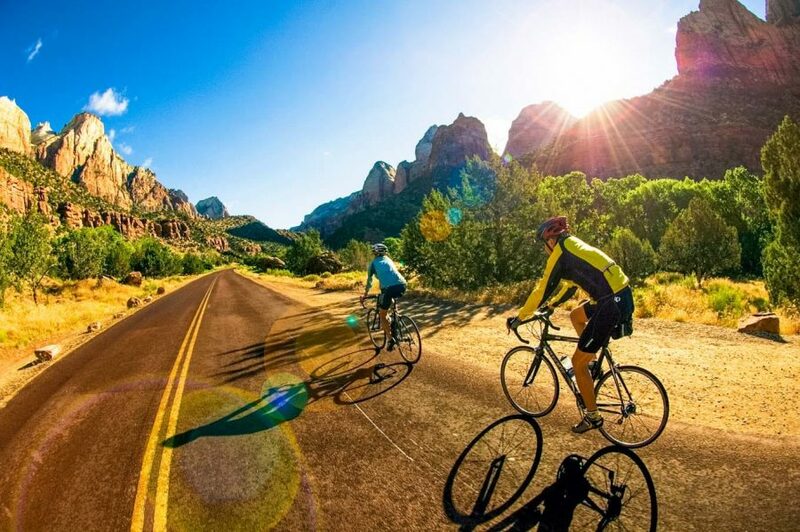 On Fitness Level 4 biking trips, guests will need the ability to ride on well-maintained roads/streets or on mountain bike trails with moderate to advanced obstacles. Elevation change is aggressive either overall or on specific challenge climbs and distances could range between 40 and 75 miles per day for road, or 20 to 30 miles per day for mountain. Guests are travelling at a group pace and may sometimes have the ability to shorten a route. 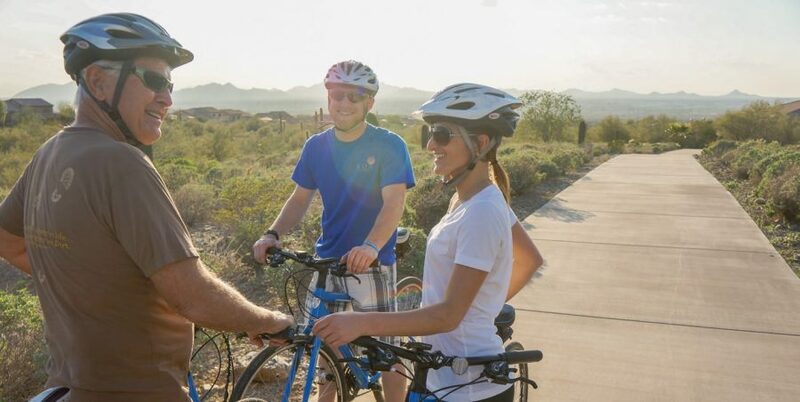 On Fitness Level 5 biking trips, guests will need the ability to ride on well-maintained roads/streets or on mountain bike trails with advanced obstacles. 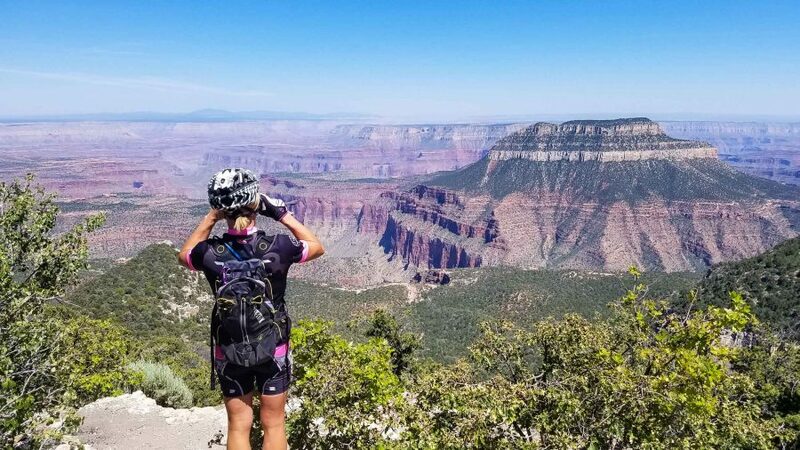 Elevation change is aggressive either overall or on specific challenge climbs and distances are often over 75 miles per day for road, and 30 miles per day for mountain. Guests are travelling at a group pace and may sometimes have the ability to shorten a route. 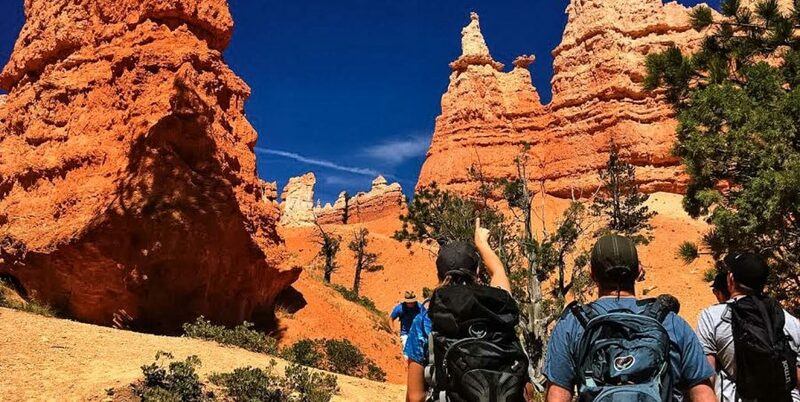 For more information on getting properly prepared for your guided trip, be sure to read all of the details in under “Trip Preparation” for your specific trip. If you have any questions, reach out to AOA’s adventure consultants at tripsupport@aoa-adventures.com. AOA’s comfort ratings have been created to help you gauge what to expect on your tour. We strive to make every trip as comfortable as possible, but most of our trips involve camping of some type, which is outside of the average person’s day to day comfort zone. Camping trips are always rated 3 or below. Comfort level 1 trips do not have showers or electricity available. Restrooms are primitive. When using AOA gear, guests can expect to sleep on a pad outdoors or in a small tent. Meals will consist of single-entrée foods, some of which will be freeze-dried or dehydrated foods with few fresh options, and will be served by guides group-style out of pots and usually eaten out of personal utensils while sitting on ground. Comfort level 2 trips do not have showers or electricity available. Restrooms are likely primitive but could have running water or composting toilets. When using AOA gear, guests can expect to be sleeping on a pad outdoors or in a large tent. Meals will consist of single-entrée mostly hydrated foods with some fresh options and will be served by guides group-style out of serving dishes/platters and eaten with camp utensils while sitting at an outdoor table. Comfort level 3 trips are a little bit more plush and nearly could be considered “glamping.” Showers and/or electricity likely available nearby. Restrooms will be flushing and enclosed. When using AOA gear, guests can expect to be sleeping on an inflatable pad, or on a cot where available, outdoors or in a large tent. Meals will consist of all fresh food with courses and more complex additions/spicing, although often will be limited to one entrée. Meals are served by guides and may be plated or served group-style out of serving dishes/platters and eaten with camp utensils while sitting at a covered outdoor table. Comfort level 4 trips stay in lodges where showers and/or electricity available nearby but showers may not be private. Restrooms are established/modern. Guests can expect to be sleeping on a bed indoors, likely with climate control. Meals will consist of all fresh food, often with multiple entrée options. Meals are served by guides on the trail or by wait staff at an established canteen, restaurant, or similar. Comfort level 5 trips are only operated by AOA as private custom trips. These always have private showers and electricity available. Restrooms are established/modern. Guests can expect to be sleeping on a bed in a private room with climate control. Meals will consist of all fresh food, often with multiple entrée options. Meals are served by guides on the trail or by wait staff at an established restaurant. Other services provided by vendors (such as room service, massage, cleaning services, etc.) are likely available. Guests will primarily visit the most popular attractions in the locations listed in their itinerary. They can expect to spend some time either waiting for parking or waiting in line for shuttles, meals, etc. Crowds are likely and overnight accommodations are popular and generally close to capacity. Guests will primarily visit the most popular attractions, with some side trips to less visited areas. They can expect to spend some time waiting for parking or waiting in line for shuttles, meals, etc. Crowds are either moderate or are easily avoided in some locations and overnight accommodations are generally popular and utilized by other guests on a nightly basis. Guests will see attractions less visited by the masses with some side trips to more popular areas. They can expect very little waiting time for parking, shuttles, meals, etc. Crowds are moderate and/or are easily avoided if present. Overnight accommodations may be popular but have a feeling of solitude and privacy. Guests will move through popular attractions but will spend most of their time in hard-to-reach or less popular areas. They can expect no wait time and a practical lack of crowds once they’ve left these more populated areas. Overnight accommodations are remote and/or private. Guests will visit only remote, hard-to-reach, and secluded attractions. Few, if any, other visitors will be encountered throughout the itinerary. Overnight accommodations are remote and/or private. All AOA adventure tours assume our guests are capable and willing to participate in some group tasks such as setting up your own tent, inflating your sleeping pad, carrying a backpack, and retrieving water from a remote source. Guides are on-hand at all times to provide assistance or instruction where needed. Tasks and their required frequency are commensurate with trip type. Very few group tasks exist; most chores will be handled by your guide. A moderate amount of group tasks exist. Set-up and tear-down will only need to occur upon arrival and departure. This trip style requires the most commitment to group tasks. Set-up and tear-down will only need to occur upon arrival and departure. The same amount of tasks exist as with all our basecamp trips, although set-up and tear-down will be performed each time we move camp, usually 1 to 2 times. The same amount of tasks exist as with all our backpacking trips, although set-up and tear-down will be performed each time we move camps, usually 1 to 2 times.